The Igeam Group organized a seminar entitled “Aspetti emergenti nella gestione dei rischi a lavoro. 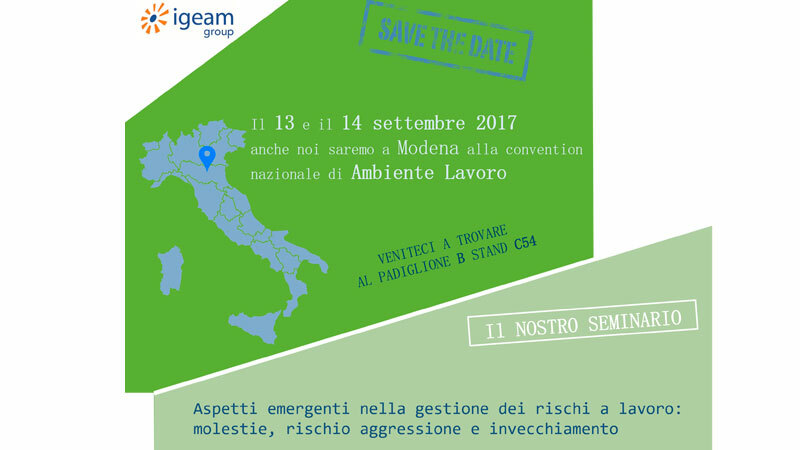 Molestie, rischio aggressione e invecchiamento” in Modena, during the Ambiente Lavoro convention, on Thursday 14th September 2017. One of the most important topics discussed during the seminar was the side effects of external workplace aggression for workers and employers. Many factors turn workplace into a risky working environment. Some of them are more visible and manifest and the side effects produced are immediate in their own consequences. Other factors, on the contrary, are much more unpredictable and complex because they are deeply linked to social and cultural matters, including harassment and aggression taking place at work. These controversial situations negatively impact on employee well-being. Not surprisingly, some workers experience stress-induced anxiety and depressed mood, others give up work because they feel incapable of facing even the most ordinary activities. The following seminar has been organized precisely to discuss the profound implications of the above-mentioned issues and come up with concrete proposals for better tackling such controversial events. The Igeam experts, in this respect, have also presented a newly developed methodological tool at same time capable of classifying external workplace aggression risks, of reducing their negative social impact, and of increasing workers’ awareness. The seminar, therefore, has been an opportunity for all participants to learn more about the instrument and its positive effects on the phenomenon at issue. L’accordo su molestie violenze nei luoghi di lavoro: a che punto siamo?